Catalog Page 15. Order 6" and 8" soft teddy bears with printed t-shirts or printed ribbons. Catalog Page 15 - Jamie Bears. One of our most popular styles. 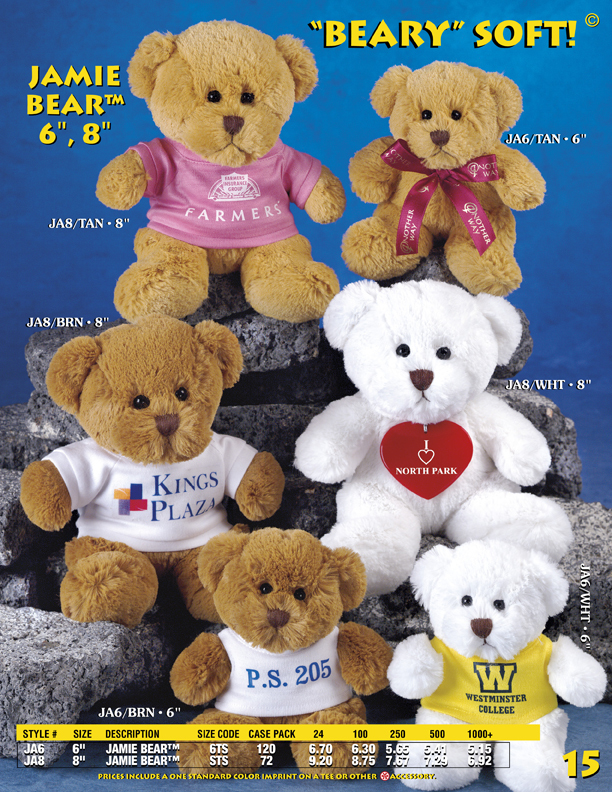 The pricing for these 6" and 8" soft teddy bears includes the printed t-shirt or printed ribbon. Choose from three colors: white, brown or tan. The Jamie Bears use crystal eyes. The lead-time for production is 10 - 14 days. These bears are very soft. All of our teddy bears and stuffed animals are hypoallergenic. In addition to teddy bears with t-shirts, we also offer printed accessories including hats, scarves and ribbons. If you order more that 1,000 pieces, we can manufacture custom embroidered your teddy bear or stuffed animal, instead of using a T-Shirt. We have over 30 years of experience manufacturing stuffed animals. Send us your design today.